Avengers: Endgame fans have been bombarding actress Scarlett Johansson with the weirdest and meanest comments. Sure, she is one of the favourite Avengers for Marvel fans. But she too has to bear the brunt of being asked or rather directed with rude comments concerning her height. During one of her interviews with the Cosmopolitan UK, Scarlett Johansson revealed how she is constantly asked about or commented over her height. She quoted to the magazine, "'Wow, you're really short.' I get that a lot. [They say] 'You're a lot shorter than I thought you were'. I'm like, 'Wow, how is that ever OK to say to someone? [laughs]' It's so bizarre. Yes. It's, 'You're really short." For those who aren't aware of this fact, Johansson's height is reportedly 5'3". Hence, all the short jokes. However, as an actor, she just brushes away all those questions and mean comments. Well, if anyone has made a debut on Jimmy Kimmel's Mean Tweets session, they would be used to the fans' comments. We will be seeing her soon assemble the rest of the Avengers in the upcoming Endgame film. Since it has been a decade since the 34-year-old actress has been associated with Marvel, the final film is a bittersweet farewell for her. She told Digital Spy, "It does feel the end of an era, for sure," she said. "It's 22 movies, a decade of work, and you're never going to get this again." Further adding how it is a strange feeling to wrap her head around the fact that Avengers is coming to an end, she said, "It's strange. It's hard for me to wrap my head around. I don't know necessarily that I have a perspective on it yet. Every two years for the past decade, more or less, I've returned to this pillar of support that is this Marvel family, and just knowing that it won't exist in this context anymore – it's bittersweet." Avengers: Endgame is set to release on April 26. 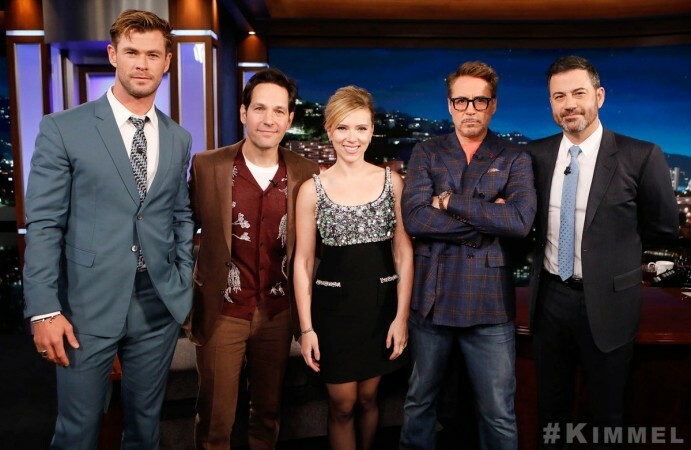 The film also stars Robert Downey Jr, Chris Hemsworth, Chris Evans, Mark Ruffalo, Paul Rudd, Don Cheadle, Bradley Cooper, Brie Larson, Josh Brolin and more.